Delacorte Press Books for Young Readers, 9780385736534, 373pp. Sixteen-year-old Zeeta and her flighty English-teaching mom, Layla, have traveled the world together, settling in a different country every year, making a whole new set of friends and adopting new customs. This year, they ve chosen to live in Aix-en-Provence, France, an enchanting city full of fountains, creamy yellow light, and a fascinating group of scarlet-clad street performers. Zeeta soon begins to receive mysterious notes and gifts from someone she calls her fantome, " "or ghost, admirer. But she is expecting her boyfriend, Wendell the love of her life, as her friends call him to arrive in Aix for a summer program very soon. Zeeta brushes off her curiosity about her fantome, " "and her simmering attraction to one of the street performers, Jean-Claude, until Wendell arrives and she begins to fear that her feelings for him have truly changed. Perhaps like Layla she's simply not made for long-term romance. As Zeeta tries to draw away from Wendell, however, circumstances seem to force them together. Zeeta's friendship with a local antiques dealer and his reclusive artist friend leads to a dangerous adventure. When Zeeta and Wendell join forces to find a secret underground spring whose water is rumored to bring immortality, they are forced to reconsider their own desires, and their beliefs about true love. Yet as soon as Zeeta decides that her mind has cleared, she's confronted with the biggest shock of her life: the incredible true identity of her fantome. 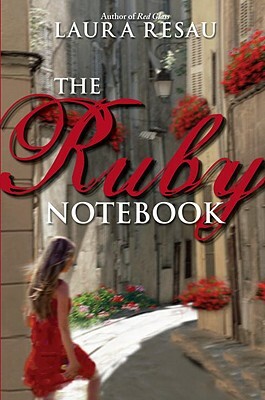 Vibrant, warmhearted, and evocative, The Ruby Notebook" "is a remarkable novel about learning to accept love in all of its wondrous and imperfect forms. Laura Resau lived in the Mixtec region of Oaxaca, Mexico, for two years as an English teacher and anthropologist. She now lives with her husband, her dog, and her son, Bran, in Colorado, where she teaches cultural anthropology and ESL (English as a Second Language). She is also the author of What the Moon Saw, available from Yearling, and Red Glass, The Indigo Notebook, and Star in the Forest, all available from Delacorte Press.